Various forms of craft have long been associated with elevated aesthetic expression and high cultural capital in Japan. However, the late nineteenth and twentieth centuries saw transformations of craft’s epistemological underpinnings, and the collapse of Japan’s feudal system gave rise to the multivalenced concept of “art craft” (bijutsu kōgei). This presentation will trace the rise of craft as art in the 1910s and 1920s by examining the early work and praxis of “art craft” pioneer Tomimoto Kenkichi (1886–1963). 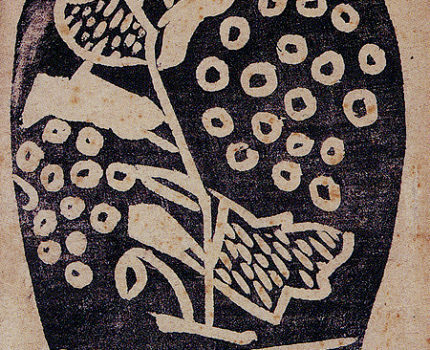 After Tomimoto’s return to Japan from study in England in 1910, he experimented with a range of mediums resulting in s­ōsaku hanga (creative prints), Raku ceramics, and a variety of craft objects inspired by the ethos of the British Arts and Crafts movement. These works relied on self-taught methods of production and emphasized original surface images (moyō) derived from sketching from life (shasei). This analysis of Tomimoto’s early works reveals that “craft” became “art” in early twentieth century Japan through a set of self-reflexive engagements with craft mediums according to the ideological and artistic values of modernism and within the discourse of selfhood in modern Japan. Meghen Jones, Robert and Lisa Sainsbury Fellow at the Sainsbury Institute for the Study of Japanese Arts and Culture, is a historian of Japanese art with a focus on ceramics, modern craft, and art in transnational perspective. She received an MA in Industrial, Interior, and Craft Design from Musashino Art University and she completed her doctoral studies in Asian Art History at Boston University. Her dissertation, “Tomimoto Kenkichi and the Discourse of Modern Japanese Ceramics,” examines the art, praxis, and theories of Tomimoto Kenkichi as a case study for illuminating the central mechanisms responsible for the emergence and development of modern Japanese art ceramics. She is currently revising the dissertation into a book manuscript. Before coming to SISJAC, she was Teaching Fellow in Japanese Studies at Earlham College and Visiting Researcher at the Crafts Gallery of the National Museum of Modern Art, Tokyo.